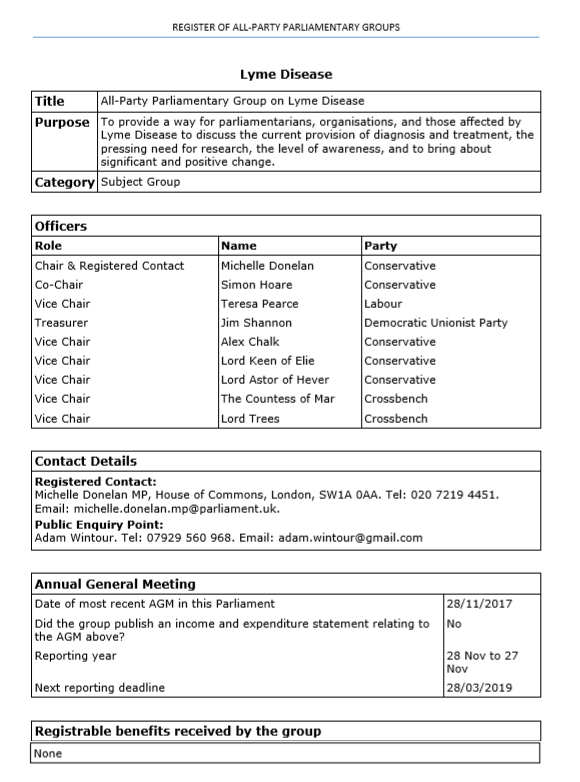 Following its first meeting, the All Party Parliamentary Group (APPG) on Lyme disease held its inaugural AGM on 28th November and appointed officers. 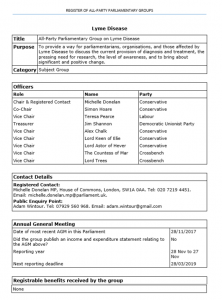 APPGs are for groups of parliamentarians who have a specific interest, in this case Lyme disease, and provide a ‘safe’ place where MPs and members of the House of Lords can discuss with, and seek evidence from, other interested parties. Announced officers are: Michelle Donelan MP and Simon Hoare MP co-chairs, Alex Chalk MP and Teresa Pearce MP vice chairs, Jim Shannon treasurer, and from the Lords, Lord Astor, Lord Keen, Lady Mar and Lord Trees. All have an interest in Lyme disease. Lyme Disease Action (LDA) and nine patient groups have now been invited to a meeting “to discuss the direction of the APPG”. The meeting, on 23 January 2018, will be in London and is scheduled for only 1 hour and each group will be given the opportunity to present its views.